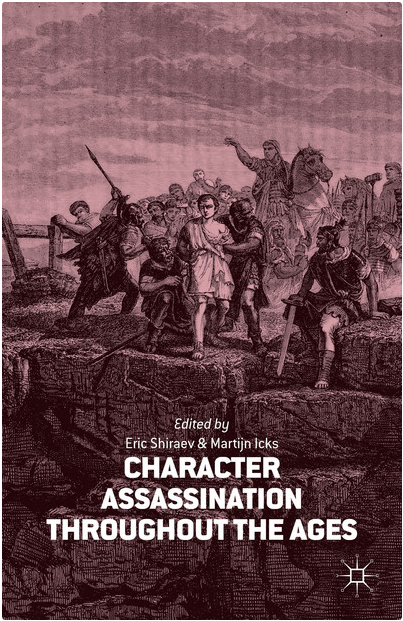 In July 2014, our edited volume Character Assassination throughout the Ages will be published by Palgrave Macmillan. Ranging from ancient Rome to Communist China and the modern-day U.S., and featuring kings and queens, popes and prophets, emperors and presidents, it examines how character attackers have been attempting to damage and destroy the reputations of their victims in a wide variety of historical cultures. This volume is the result of the 2011 seminar Character Assassination: The Art of Defamation throughout the Ages at the University of Heidelberg. Next to papers which were presented at this event, it contains several new contributions. The seminar Character Assassination: The Art of Defamation Throughout the Ages, will take place at the IWH Conference Center at Hauptstrasse 242. Directions can be found below. Further information on the center can be found on the “Colloquium Location” page. We are pleased to present you with the official Colloquium Poster for the seminar Character Assassination: The Art of Defamation Throughout the Ages. On it, you will find the schedule for all three days. We hope it will draw many interested listeners to July’s colloquium. As an initiative group for the 2011 seminar, Character Assassination: the Art of Defamation throughout the Ages, we would like to invite you to participate in this interdisciplinary event. It will take place at the University of Heidelberg, Germany, July 21-23, 2011.